Starting Monday you can enjoy a nutritiously balanced bento from FUJI Catering for lunch and buy a child in Africa lunch through the charity Table for Two at the same time. 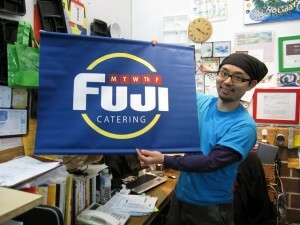 FUJI Catering, the only bento delivery company in New York City, has formed a partnership with Table for Two, a non-profit organization based in Japan. Through this partnership, FUJI Catering and Table for Two (TFT) will create nutritious bento lunches to be delivered to participating companies that order from FUJI Catering. For each bento, FUJI Catering will donate twenty-five cents to Table for Two’s program to fight hunger in Africa. Founded in 2007, Table for Two works to combat obesity in developed countries while eradicating malnutrition in impoverished ones. The non-profit provides healthy food options with their TFT-branded meals and snacks. With twenty-five cents from each sale, TFT contributes school lunches that feed hungry children in the African countries of Uganda, Rwanda, and Ethiopia. In Japan, TFT has the support of corporations, government offices, and universities, which sell TFT meals in their cafeterias; restaurants, which include TFT meals on their menus; and convenience stores. After opening an office in New York City, TFT formed partnerships with Columbia University and Hakubai, the restaurant at the Kitano Hotel. With the support of these partnerships, TFT served more than five million meals to needy children in Africa. “FUJI Catering has always promoted healthy eating through our nutritious bento, so collaborating with Table for Two is a natural fit for us,” says Toru Furukawa, president of FUJI Catering. Through this collaboration, FUJI Catering and TFT hope to reach more New Yorkers in their dual effort to end both obesity and poverty. The two organizations will begin their joint effort through the sale of TFT-branded FUJI Catering bento at Columbia University. From there, their goal is to expand to other companies throughout New York. “New Yorkers who order from FUJI Catering can feel twice as good because they are making healthy choices for themselves and donating to a worthy cause,” says Furukawa.